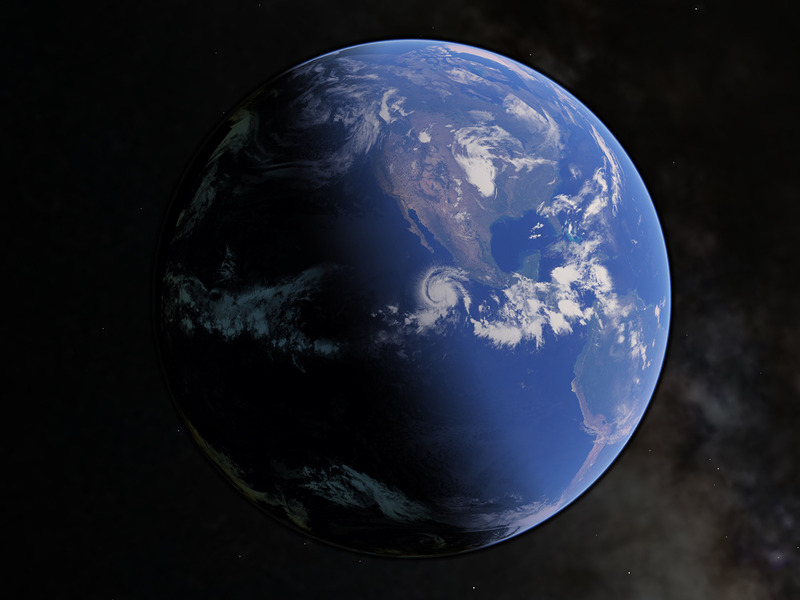 Google Earth ProAn illustration of Earth during the June solstice. The June solstice of 2018 happens today, June 21, marking the first day of summer for the northern hemisphere. Earth‘s tilted axis and orbit around the sun – not the planet’s rotation – is the driving force behind a solstice. The June solstice of 2018 happened this morning at 6:07 a.m. ET. To people who live in Earth’s northern hemisphere, Thursday marks the longest day of the year. It also signals the end of spring, the arrival of summer, and a gradual retreat toward the fall season, which is marked by an equinox. For those in the southern hemisphere, it’s exactly the opposite: The June solstice marks the start of winter, when days have reached their shortest and darkest, though daylight will last longer and grow stronger as the September equinox approaches. Two things drive this all-important seasonal clock: Earth’s tilted axis and the planet’s orbit around the sun. That tilt is about 23.45 degrees (for now), and it bathes different parts of the world with various intensities of light over the course of a year. Meanwhile, Earth’s rotation around its axis keeps the sun’s heat even, sort of like a 7,917-mile-wide rotisserie chicken made of rock and a little water. Shayanne Gal/Business InsiderHow Earth’s axial tilt and the sun work to create the June solstice, which marks the start of summer in the northern hemisphere. The length of daylight will be at its longest, too. This gets more extreme the more north you go, since there’s more of Earth’s atmosphere to refract sunlight the farther you are from the equator. But this moment won’t last, since the Earth makes its way around the sun at a speed of roughly 66,600 mph. Our planet’s orbit is elliptical and its center of gravity slightly offset from the sun. 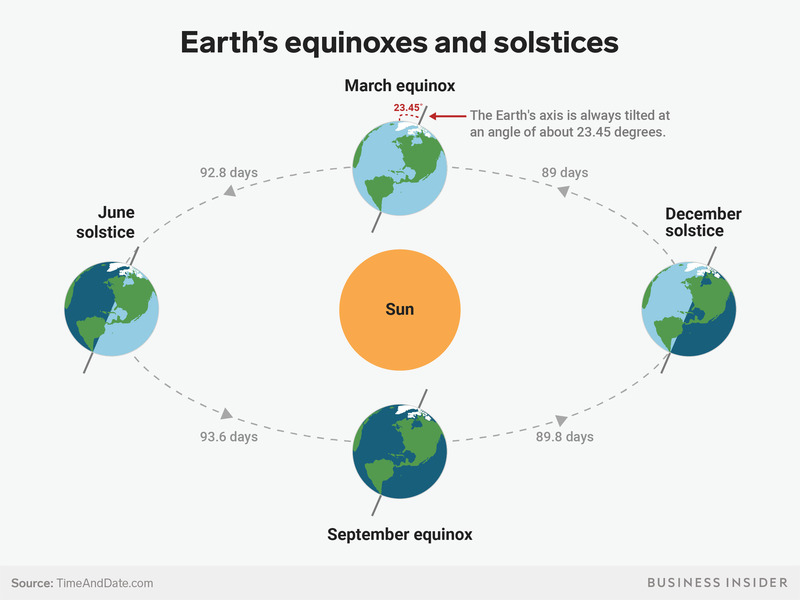 Shayanne Gal/Business InsiderHow Earth, its axial tilt, and the sun work to create solstices, equinoxes, and seasons. 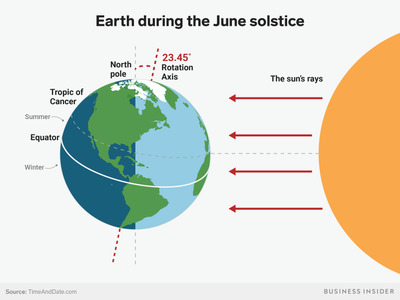 As the graphic above shows, it takes 93 days and 16 hours after the June solstice for Earth to reach the September equinox – that’s when the most direct rays of the sun have slipped back down to the equator. Another 89 days and 19 hours later, it will be the December solstice. At that point, the sun’s most direct rays reach the Tropic of Capricorn, winter starts for the northern hemisphere, and summer begins for those south of the equator. 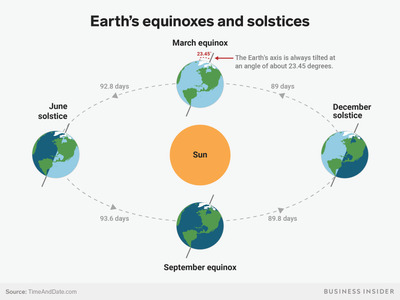 Then it takes 89 days for the sun’s zenith to get back to the equator and kick off the March equinox, followed by 92 days and 19 hours to complete the cycle with the June solstice. During each of these phases, certain regions of Earth’s surface get more sunlight, leading to the creation of seasonal temperatures and weather variations. This story was originally published at 9:44 a.m. ET on June 10, 2018.